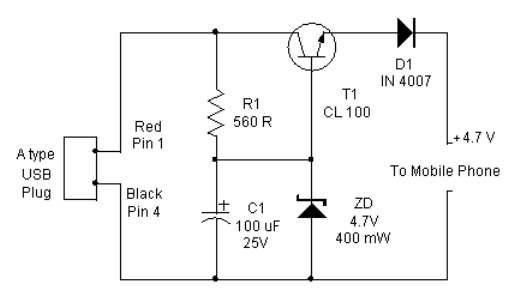 This is the circuit diagram of rain detector alarm. When the sensor is wetted with the water, then the alarm will be activated. This circuit can be used for other purposes. A 555 astable multivibrator is used here which gives a tone of about 1kHz upon detecting water. The sensor when wetted by water completes the circuit and makes the 555 oscillate at about 1kHz. The sensor is also shown in the circuit diagram. 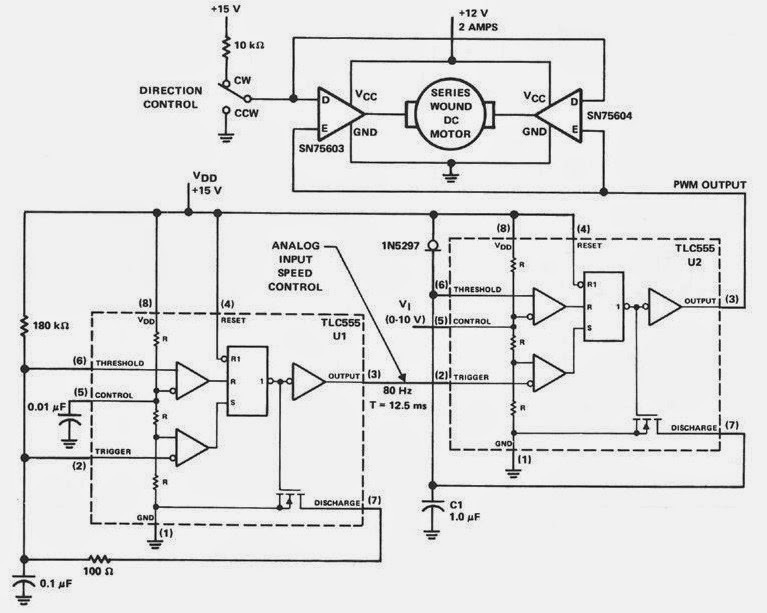 This is the circuit diagran of two tone electronic siren. The scheme is simple and easy to built, it based on two ICs with different task: produce audio signal and amplify the audio signal. Here the circuit diagram of PWM Controller which uses complementary half-H peripheral drivers SN75603 and SN75604, with totem-pole outputs rated at 40 V and 2.0 A. These drivers effectively place the motor in a full-bridge configuration, which has the ability to provide bidirectional control. This is the schematic diagram of cellphone charger circuit which connecter to the USB as main power. Whit this circuit, you can charger your cell phone from USB port in your PC or notebook. The majority of the cellphones battery is appraised 3.6 volts at 1000 to 1300 mah. These battery packs have 3 Nimh or Lithium cells having 1.2 volt rating. Generally the battery pack requires 4.5 volts and 300-500 mA current for quick charging. Anyway, low present charging is better to build the proficiency of the battery. The circuit depicted here gives 4.7 directed voltage and sufficient present for the moderate charging of the cellphone. This schematic diagram is a light-operated, remote-controlled solidstate switch circuit to handle lamp. While in darkness, the resistance of Light Dependent Resistor (LDR) is extremely hight, it shoots up to megohm range. As a result, the triac isn't going to have gate drive and therefore it doesn't conduct.